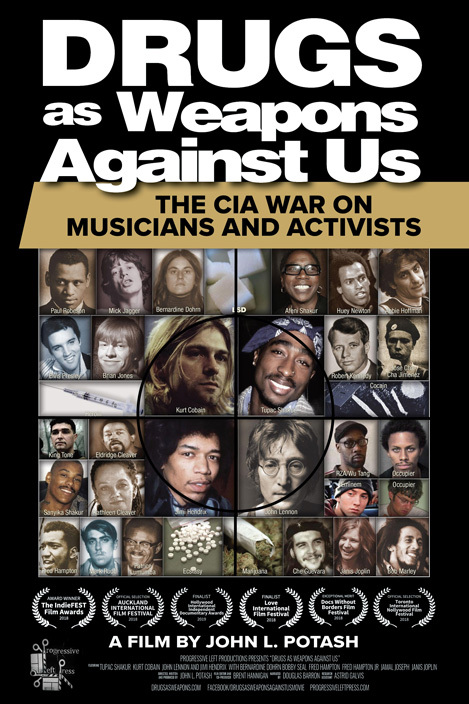 John Potash’s recent book, Drugs As Weapons Against Us: The CIA’s Murderous Targeting of SDS, Panthers, Hendrix, Lennon, Cobain, Tupac and other Activists, was published in May of 2015, with the corresponding documentary released just this past January (2019), titled, Drugs as Weapons Against Us: The CIA War on Musicians and Activists. Both have been received extremely positively, pulling together a host of historical facts, analyses, and thorough research, resulting in a well-presented stance that certainly holds water. His first book was titled, The FBI War on Tupac Shakur and Black Leaders, released in 2007. Potash has been featured on C-Span’s American History TV, A&E, The Reelz Channel, The Real News Network, and RT television networks. Furthermore, he’s appeared on hundreds of radio programs in the U.S, England, and New Zealand, including Coast to Coast AM, and has published a handful of articles in various magazines. That aside, though, it is also important to mention that he has worked as a counsellor for people with mental health problems and addictions for over 25 years now. So he is certainly no newcomer or sideline spectator when it comes to this topic. 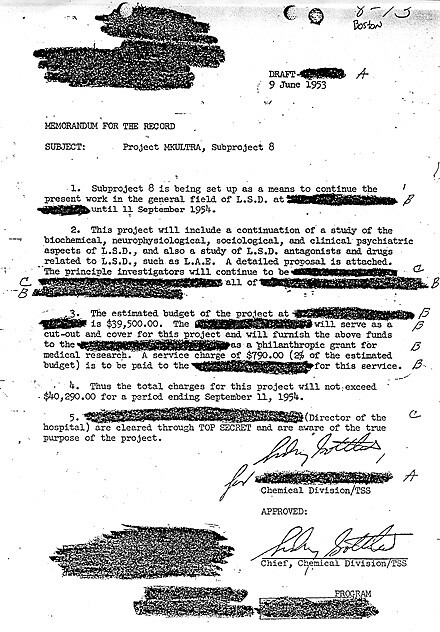 Approval of an MKULTRA subproject on LSD from Dr. Sidney Gottlieb, best known for his involvement with the CIA's 1950s and '60s assassination attempts and mind control program, known as Project MKULTRA. We question Potash from an array of different angles. We ask him when he first noticed the correlation between drugs in the music scene, and the possibility of conscious and targeted manipulation. 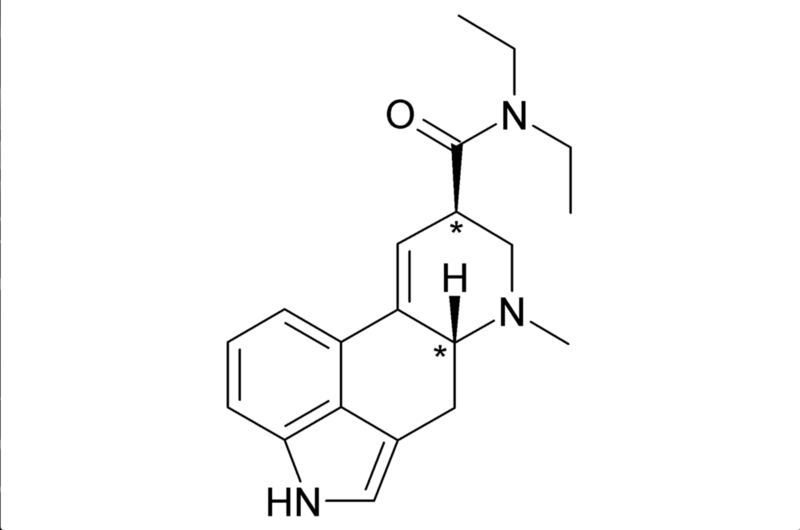 We also briefly delve into the debate of whether LSD might actually be a “mind-opening” and beneficial drug. We’ve all heard both sides before: 1) it heightens your state of consciousness and makes you more spiritually aware, 2) it is extremely bad for you and turns your brain to mush (yes, of course that’s the technical term). Things start to get murky when you start wondering whether the government has been double-bluffing all along, i.e. demonising the drug, in turn leading leftists to believe it is beneficially mind-altering, but in actuality pushing its use in this nefarious and roundabout manner. We also address the beginnings of CIA involvement and experimentations in the UK, as well as their involvements in the Laurel Canyon scene, often touted as the epicentre of the hippie and counterculture movement. 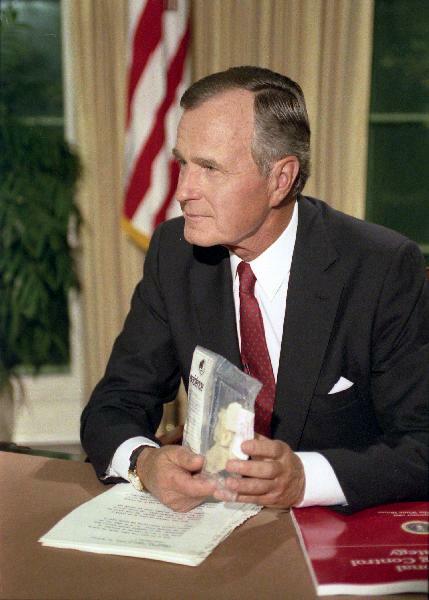 Former CIA Director and U.S. President, George H. W. Bush holds up a bag of crack cocaine during his Address to the Nation on National Drug Control Strategy. We then move into discussing how the Black Panther Party was affected, and how Tupac Shakur (and Afeni, his mother) played into this. Particularly pertinent to this point is the rise of the crack epidemic and drug-trade in general. The story has roots that many might not be comfortable acknowledging: Nazis that fled to South America and established their own colonies created a partnership with local cocaine drug manufacturers. Thus, they had found a new career in drug trafficking, helping to shape a number of cartels, including Escobar’s Medellin cartel. I think people who know a little about Nazi history wouldn’t be so surprised: after all, they were known to be drug fiends, with their soldiers being prescribed methamphetamines during battle, and Hitler known to have been addicted to opiods, cocaine, and meth. The big question at the end of the day: do oligarchs control alternative media and news outlets? To what extent can we trust “regular” news sources, and to what extent can we hold “fringe” and “alternative” news up to the same test? You start to gradually realise that our rational thinking becomes foggy, facts become clouded, and we have to begin truly sieving through all this information in a far more critical manner that we had previously thought. We hope you enjoy the show, and do let us know what you think. Spread the word and spread the love!